Okay, to be fair, I've never really lived anywhere but Guelph, so I can't say without bias that Guelph is the best, but I can say that Guelph has a very awesome community online. I can also say that Guelph has a very accessible group of leaders who respect each other and the people they represent. I don't know how many other cities have business leaders, city staff, councillors, police chiefs and neighbourhoods groups having such open conversations on Twitter and doing such a great job of being neighbourly. 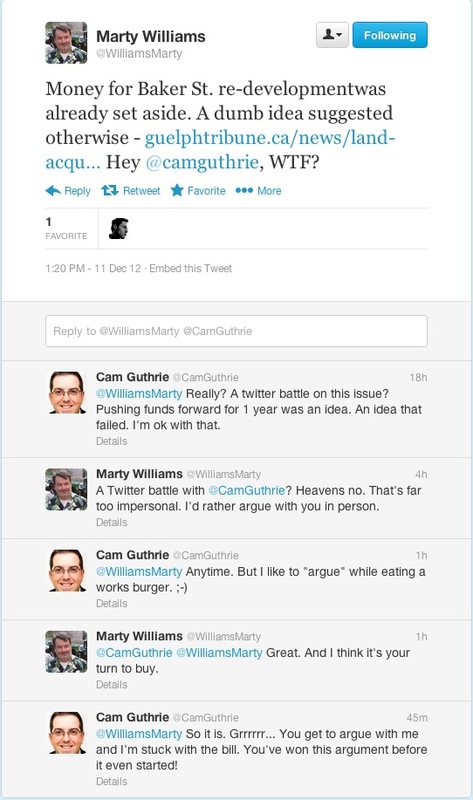 Today, I was tickled to see this exchange between the director of the Downtown Guelph Business Association, Marty Williams and a city councillor, Cam Guthrie happen on Twitter. I love that what could have turned into an ugly and awkward flame war instead became two guys having lunch at a local business and sharing a few laughs. Twitter is a great way to get your message across, but it's also a great way to build respectful and meaningful relationships offline. 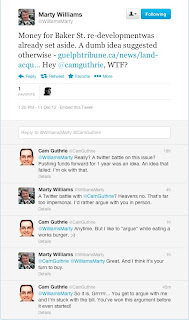 Don't get caught in a back and forth on Twitter. Listen to people, share your concerns and if it needs a larger discussion, do it offline, in person where communication has so much more to it that 140 characters.